Buying a book to support non-mainstream authors' livelihoods is a small but very meaningful action anyone can take. Since we are what we do every day (Aristotle: "We are what we repeatedly do"), if our daily actions consist of supporting, affirming or acquiescing to the status quo, any claim of "being outside the mainstream" is unsubstantiated. The core purpose of this blog is to describe the perspectives, goals and actions of constructing a resilient, sustainable and largely independent way of living that opts out (as much as is practical) of the self-destructive fakery and inauthenticity of the status quo. One small but very meaningful action anyone can take is to buy a book or ebook written by a non-mainstream author. The publishing industry, like every other mainstream sector, has consolidated into a handful of global giants that own dozens of imprints/subsidiaries. You can buy a dozen books, each one published by a different house/imprint, and the money all flows to one corporation. Outside of this cartel lies a wilderness/desert of self-publishing and small, independent publishing houses which are often operated by one or two people. A narrow ecosystem of mid-sized and academic publishers lies between this core and periphery. Most of the authors in the academic press have jobs in academia, and as a result they do not rely on royalties from book sales to pay their bills. The farther an author is from the mainstream, the more precarious and marginalized his/her income will be, for all the obvious reasons: since the mainstream academic press and corporate media/publishing world (in many cases, one and the same corporation) derive no financial benefit from independent books and authors, they are shunned. The outlier book by an unknown that achieves liftoff to mainstream recognition and financial success is always hyped to the heavens, but the reality for 99.9% of self-published/small press authors is a place far from the bright spotlight of corporate media coverage and a trickle of sales. Being self-published does not necessarily make one an independent voice, of course, and so the goal I am suggesting is supporting independent, non-mainstream authors regardless of the publisher of their work. Buying a used book is a perfectly fine action, but the author receives no fee for the work of writing the book. I buy many used books by deceased authors or books that are no longer in print, i.e. a used copy is the only available option. The War State: The Cold War Origins Of The Military-Industrial Complex And The Power Elite, 1945-1963 by my blogging colleague Mike Swanson. The book has garnered dozens of very positive reviews on amazon.com, and I recommend it to anyone with an interest in understanding how the U.S. developed into a permanent war state and economy. The Wealth of Nature: Economics as if Survival Mattered by John Michael Greer, an independent thinker whom I admire greatly. Greer has written many books; please browse his catalog to discover the wealth of his writing. Immoderate Greatness: Why Civilizations Fail by William Ophuls, another independent thinker whom I hold in great esteem. 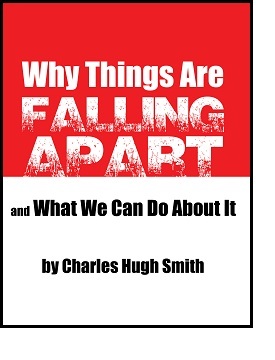 This book, a mere 75 pages, is a succinct summary of core issues we now face. Michael Pettis is one of the small circle of economists who do not simply accept conventions as truths. I found out about his latest book The Great Rebalancing: Trade, Conflict, and the Perilous Road Ahead for the World Economy from Mish, who invited Pettis to speak at his conference in Sonoma earlier this year. Pettis' analysis was so clearly stated and insightful that I was scribbling notes madly during his presentation. In a number of cases, independent authors help each other during the final editing of their works by reading drafts and offering suggestions. 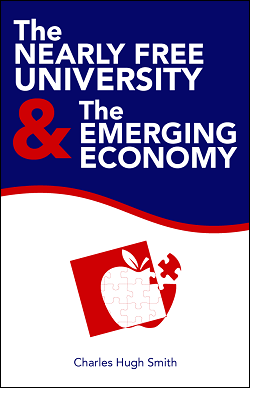 I played just such a modest role in Adam Taggart's career-development workbook, Finding Your Way To Your Authentic Career, which is a natural companion for the second half of my book The Nearly Free University and The Emerging Economy. There are thousands of books and authors worthy of support; I have listed a few by way of example. You undoubtedly have your own favorite independent authors; please consider supporting them financially by purchasing one of their works, for yourself or as a gift. You will recognize many such authors and books in my substantial and interesting list of Books & Films. I think you will enjoy browsing the dozens of subcategories even if you have no intention of buying a book or film. Thank you, Stephen S. ($5), for your most generous contribution to this site-- I am greatly honored by your support and readership.